Many homeowners are spending upwards of $90,000 for professional holiday and installation, but how much are you willing to put down to make your neighbours go ooh and ahh? Each year our taste for décor becomes more and more elaborate, and once you get a taste for the holidays it can be a bit hard to stop. But the larger the home, the more elaborate or exotic the architecture, the more risky it can be to decorate your own home for the holidays. It’s no wonder so many Canadians are turning to professional décor and installation! Sure, Christmas is beginning to wind down, but it never hurts to look forward to next year. And with displays becoming more and more elaborate each year, it can pay to have a pro handle it for you – because, let’s face it, getting those decorations up can be difficult AND risky, to say the least! While you may end up spending tens of thousands of dollars for decorations, you’ll also be able to go for a more extravagant, more elaborate display than you ever could have done on your own. Better yet, many companies charge you for the decorations the first year and from the on out only charge you to install them. 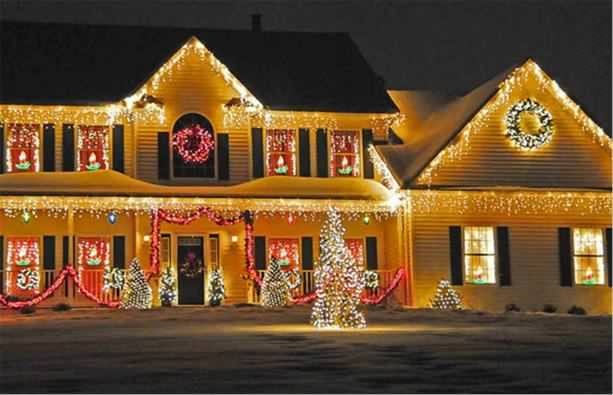 According to one Christmas lighting specialist, the need for professional Christmas decorations has grown almost 25% every year for the last 5 years. Different lighting companies offer different services. Some will send a consultant to your house to discuss themes and figure out a way to bring your vision to life, others will just work to get things installed and have a few pre-created designs for you to choose from. Do they know if they provide decorations? Are they licensed, bonded, do they carry liability insurance? How much of these costs are passed on to you? How much experience do they have decorating homes in the thick of winter, anyway? You won’t also just get decorations – you’ll get looky-loos too. No matter where you live (lest you live on a private road in the country or in a gated community), you’ll have to wonder just how many people are going to appear outside your house on the street to take pictures and enjoy the show. You have to ask yourself, just how much would you spend on your Christmas decorations? How much would you spend to capture that nostalgia, that feeling from when you were a child? It may be a little more grand, a little more bright than it was when you were a child, but many of us would do just about anything to do it all over again.